From left, former NorthWood Panther Tanner Roberts and former Whitko Wildcat Alex Smith pose at halftime with the Michigan Thunderhawks. NAPPANEE — When Alex Smith and Tanner Roberts were young boys, the pair were introduced to each other as stepbrothers when Smith’s mother married Roberts’ dad. The two spent so much time together they fought like brothers, but also developed a bond as strong as anyone sharing a bloodline. The two men had more than just a marital link in common. The two love sports and are gifted in multiple athletic disciplines. 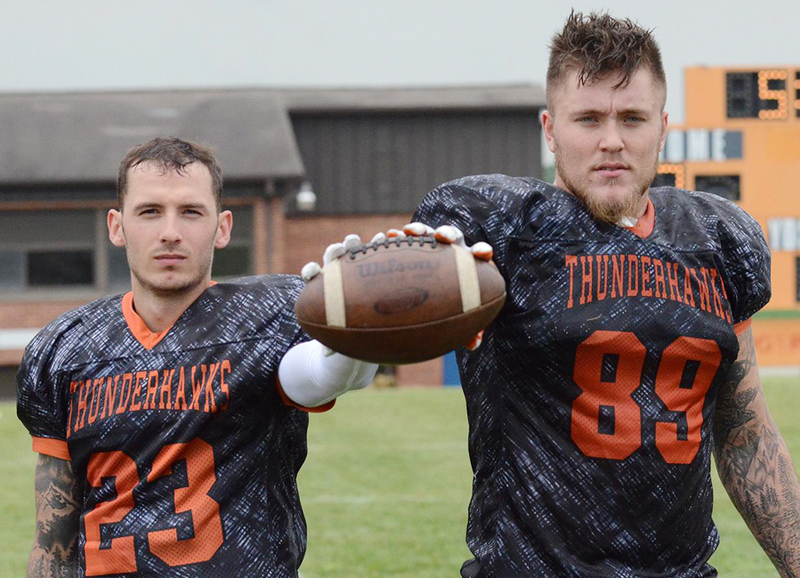 This link has culminated in both men taking the field as teammates on an independent football team based in Nappanee, not far from Roberts’ hometown of Wakarusa. Roberts, 24, is a 2012 graduate of NorthWood High School where he lettered in both baseball and football. 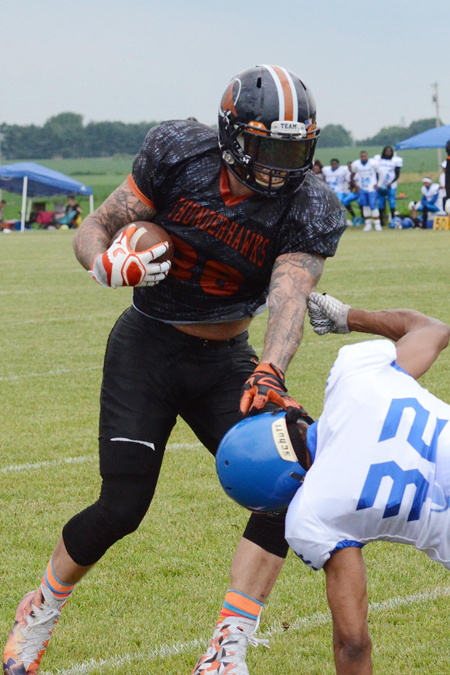 He is in his second year with the Michiana Thundershawks, currently leading the Battle Ground Football League at 4-0. Roberts plays wide receiver and performs all the team’s kicking duties. The former Panther graduated from Indiana State University with a degree in recreation and sports management. He sports an NFL-worthy 40-yard dash time in the mid-four-second range. Smith graduated from Whitko in 2013 where he played baseball for one year before moving to track as a discus thrower. Smith sat out his freshman year of football due to a knee injury when he played football in the Warsaw system as an 8th-grader. He lettered in football as a Wildcat before playing four years for the NCAA Division III nationally-ranked Franklin College Grizzlies. While at Franklin, Smith blocked a potentially game-winning field goal by Manchester University his freshman year and was named special teams most valuable player his senior season. As a 6-foot, 5-inch, 250-pound tight end, he caught 11 passes during his junior and senior campaigns for an average of 14.6 yards per catch with four touchdowns. Following his senior season, Smith played in the Dream Bowl in Virginia, a Division III showcase for NFL scouts. The two were baseball teammates for two seasons as pre-teens when both played for the same youth baseball team in Warsaw, coached by Smith’s dad. The two also played baseball in a recreational league in Terre Haute several years ago. Michiana Thunderhawk tight end Alex Smith sheds a tackler Saturday during Battle Ground Football League action. 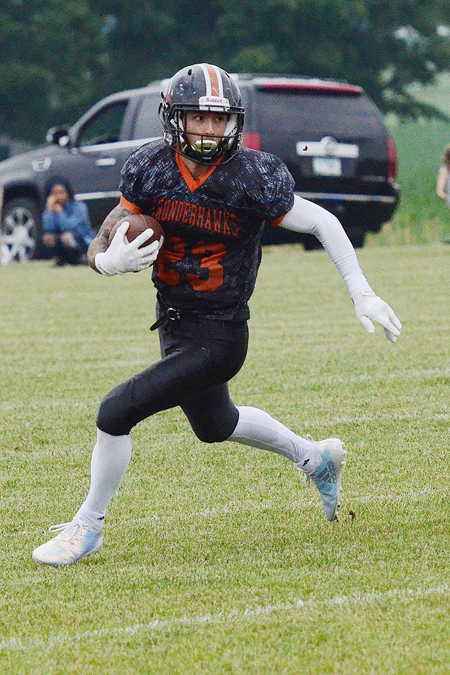 Michiana Thunderhawk wide receiver Tanner Roberts looks for an opening during Battle Ground Football League action Saturday afternoon.